Origin and Habitat: Cylindropuntia molesta is endemic to Mexico from the states of Baja California, Baja California Sur and Tortuga Island. Type locality: San Ignacio, Lower California. Habitat and Ecology: This species grows in desert and coastal sage scrub communities, among tall grasses, it occurs in volcanic soils, in sandy and gravelly alluvium in valleys and slopes of hills in dry scrubland together with Agave shawii ssp. goldmaniana, Agave cerulata ssp. nelsonii, Cylindropuntia alcahes, Hesperoyucca peninsularis, Idria columnaris and Fouquieria splendens. Cylindropuntia molesta is widespread, reasonably common, but is not abundant and has no major threats. It is well-adapted for vegetative dispersal since the spines are barbed and the stem segments easily detach. The population is scattered and forms clonal stands in places. Description: Cylindropuntia molesta (the molesting-spined cactus), is an openly branched and fiercely spined shrub with distinct trunk, and sometimes basal branching, 1 to 2 meters high (occasionally over 2.4 metres tall, or in cultivation only 60 cm high), with few, long, spreading branches that detach from the plant and reattach to your skin. However joints do not detach so readily as those of Cylindropuntia cholla. Its spines are about 5 cm long and incredibly sharp. 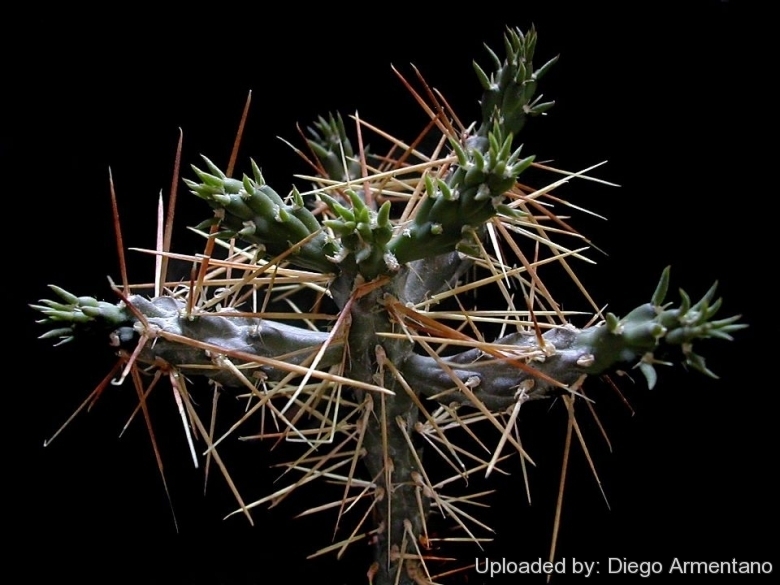 Of all the chollas of the Central Desert, none looks more vicious than Opuntia molesta. And no other Opuntia was ever better named. In actual fact it is probably no more hazardous than some of the other chollas, Cylindropuntia fulgida and Cylindropuntia bigelovii, for example; it just seems that way because the spines are longer. Two varietis are recognized on the Baja California Peninsula, Opuntia molesta var. clavellina and the more common var. molesta. Stem segments: Joints clavate to subcylindrical, firmly attached, 7-12(-40) cm long, and 1-3 cm wide, sometimes as much as 4 cm in diameter at the top, pale green to grey-green (sometimes glaucous) , with low, broad tubercles, these elongated and often 4 cm. long or more. Leaves: Linear, 10 mm long or less. Areoles: Widely elliptical, with yellowish brown wool and yellowish brown glochids, 1-2.5 mm long. In the areoles are also present small, cupshaped extrafloral nectaries, the sites at which ants appear to fill their stomach with nectar and the location of nectar buildup when ants were excluded from the plants. Spines: Few, (4-)6-10(-11), unequal, with loose, papery sheaths. The 1-5 longest ones 2.5 to 5 cm long, with orange-brown bases and orange to straw-colored or pale yellow tips, becoming purplish or almost black with age. Secondary spines 2-7, finer, 0.5-1.2 cm long. Flowers: Purple bronze but also yellow, greenish-bronze or dark maroon, showy,19-26 mm long and 3-5 cm in diameter. Cylindropuntia molesta is one of the few known gynodioecious cacti, that is to say it has female flowers on one plant and hermaphrodite flowers on another plant. Blooming season: Spring (April to June). Fruits: Ovoid, green, yellow at maturity, the fleshy fruits are 2-4 cm long and deeply excavated at the apex, distinctly tuberculate,spineless or with scattered spines. Seeds: 6 mm in diameter, irregular in shape. Cultivation and Propagation: Cylindropuntia molesta is a a much decorative hardy cactus occasionally grown for horticultural purposes. It is a summer grower species that offers no cultivation difficulties. Its cylindrical densely spiny joints provide a striking accent for an otherwise dormant cactus garden. Propagation: Propagation: scarified seeds, stem division. The stem segments root easily and grow rapidly when placed in loose, well-draining soil.